This weekend’s Boston Saturday League action saw a late goal earn Pointon an away victory in a 4-3 win at Skegness Town in the Workforce Unlimited Premier Division. Railway Athletic also had an away win after finishing 3-2 at Billinghay. Ruskington Rovers put four goals past Old Leake and Leverton earned three points at home to Fulbeck after Dom Goddard scored four goals to end the game 4-1. Wyberton Reserves are still looking for their first three points of the season after their trip to Benington ended in a 2-1 defeat. Fishtoft also started their season off with a 2-0 loss after travelling away to Coningsby. Shaun Boothby and Andrew Chapman were the goal scorers. In Division ONe, Boston College earned their second win in two games with a 2-0 victory against Horncastle Town Reserves. A goal from Nathan Rivett and an own goal sealed the deal. Also puting away two goals were Kirton Town, who travelled to JFC seniors. Their goals came from Lee Orrey and Leon Creasey. Swineshead Reserves kept up their winning ways with a 3-0 success at Friskney. Despite goals from Jason Wade and Lewis O’Keefe, Sibsey ended their first game of the season with a 2-2 draw at home to FC Kirton. Also ending on a draw were Old Doningtonians and Freiston, each scoring three. Skegness United put six goals past Pointon. Daniel Wilkes secured his first hat-trick of the season, Dominic Lyons scored a brace and an own goal made it six. Division Two saw new team Colsterworth Sport and social club bring home a strong 7-0 victory against Holbeach Bank. Goal scorers on the day were Nathan Brettoner (three), Scott Mckenzie (two), Ben Jackson and Daniel De’ath. Fosdyke travelled away to Park Utd. Despite three goals from Declan Sands and a goal from Ashley Davis, Fosdyke were pipped at the post by Park with the goals coming from Jimmy Harris (two) Ryan Huskisson, Alex Limb and Tom Limb. 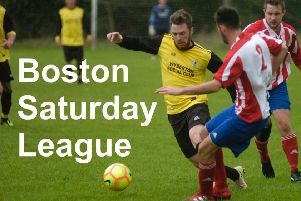 Coningsby Reserves travelled to Boston Athletic and went down 5-0 while Wyberton A beat Billinghay Reserves 6-0. Boston International secured three points with a 5-1 victory at Railway Athletic Reserves. In Division Three, Old Dons Reserves put on a show at Mareham, winning 10-1. Another goalfest came from Northgate Olympic, who put eight past Boston College Reserves. Eagle United got their first three points on the table after a 4-0 victory away from home to Spalding Harriers, goals coming from Tom Bates (two) and Luca Hall (two). Woodhall Spa Reserves won 3-2 at Swineshead Institute A and Skegness Town A make it three wins out of three after a 3-1 victory at Fosdyke Reserves.